The European Union should not freeze Turkey's negotiations to join the bloc, Germany's Foreign Ministry said, a day after members of the European Parliament voted in a non-binding motion in support of such a freeze. "It is important that we keep talking," Foreign Ministry spokeswoman Sawsan Chebli told a regular government news conference. "It is important that we do not freeze the accession negotiations because that would only further damage the relationship between Turkey and Europe, and that would not be in the interest of Turkey or of Europe," she added. EU lawmakers called for a temporary halt to Turkey's accession talks because of what they called Ankara's "disproportionate" reaction to July's failed coup. Turkish authorities have detained or dismissed more than 125,000 people -- including soldiers, academics, judges, journalists and Kurdish leaders -- over their alleged backing for the coup, in what opponents, rights groups and some Western allies say is an attempt to crush all dissent. Members of the European Parliament voted 479 to 37 in favor of the non-binding motion urging the European Commission and national governments to implement what lawmakers acknowledge would be a largely symbolic freeze in negotiations that have been going on for 11 years but have long been stalled. 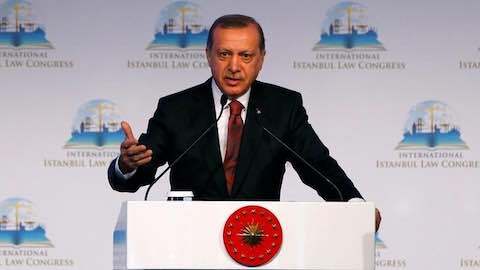 In response, Turkish President Tayyip Erdogan warned that Turkey could open its gates for migrants to Europe if pushed into a corner by the EU. Under a deal clinched in March, Turkey has agreed to take back illegal migrants and refugees leaving its shores for Greece in return for aid and visa-free travel for Turks in Europe. The deal has slashed the number of migrants reaching the EU. Chebli said the deal remained in the interest of both sides. "If one looks at the facts, then it is the case that both sides are sticking to the agreement and we hope that remains the case as it is in the interests of both sides," she said. The European Union should not suspend its talks with Turkey, Croatian Foreign Minister Davor Ivo Stier said during a visit to Slovenia. "It is not in the interest of the European Union, Croatia or Slovenia to suspend talks with Turkey ... We need a balanced standpoint toward Ankara," Stier told a news conference, without elaborating. Turkish President Tayyip Ergodan warned that Turkey could open its gates for migrants to Europe following a vote by EU lawmakers for a temporary halt to Turkey's membership talks. Before the Balkan migration route was closed in March hundreds of thousands of migrants passed through EU members Croatia and Slovenia toward wealthier western Europe. Both countries want to keep their borders closed for illegal migrants. Europe: "Europe Should Not Freeze Turkey's Negotiations to Join the EU"